Before you choose your beach wedding accessories you should decide and finalize your beach wedding dress. This will narrow down the perfect accessories to complement your gown, theme and personal style. The wrong beach wedding accessories can detract from your outfit, so think about how you can maximize the beauty of your gown with complementary accessories. Firstly you must determine whether you want to go for a more traditional look, a fun look or if you want to add some drama to your styling. There will be several accessories to decide upon. You will need to think about what to wear in your hair, what to wear around your neck, wrists and in your ears, what to wear under your dress as well as what shoes to wear and what to hold in your hands. 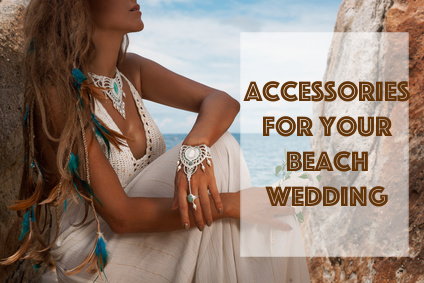 Now here you have a number of beach wedding accessories to choose from or to combine. Firstly you will need to decide whether you want to wear a veil or not. Veils are quite a traditional choice and normally do not work well on windy days on the beach, but they can be incorporated in a contemporary and chic way to suit your style. Find out more about how to incorporate a Beach Wedding Veil into your look. A beach wedding tiara is another great way to adorn your hair either with or without incorporating a veil. Your beach wedding tiara should not be overpowering as the theme is a lot more laid back than most traditional weddings. Click here for more information on Beach Wedding Tiaras or for a more informal choice Beach Wedding Headbands. There are many other exciting beach wedding accessories that you can add to your hair to complete your perfect look. You can go for flowers, adorned clips, fun headbands, hair combs and many other unconventional accessories. Click here for more info on these Beach Wedding Hair Accessories. Glam by Pam - This lovely site offers exclusive, uniquely designed bridal headpieces and vintage accessories. All their designs are one of a kind, made from vintage materials. Definately worth a look for that "something old"! Don't overdo your wedding accessories. For a less formal wedding (most beach weddings are casual), less is definitely more. Even if your dress is simple, don't overshadow the dress with flashy jewellery. Try and find a necklace to balance out the neckline of your beach wedding dress. If you are having a strapless dress then a more elaborate necklace will look stunning. A V- or scoop neckline will look nice with a V- or Y-shape necklace. If your dress has a high neckline then rather opt for drop- or chandelier earrings. If you do have beading on your dress then it will be a good idea to match the type of beading on your dress in your chosen jewellery. So pearl beading will look great with a set of simple pearl earrings and perhaps a pearl bracelet. There is also no reason why you should go for real salt water pearls when there are many gorgeous fake pearls and fresh water pearls on the market. Tasteful costume jewellery can be very beautiful and fun to shop for without breaking the budget. Follow this link for a few ideas on beach wedding necklaces, bracelets and earrings. What? Beach wedding accessories to wear under your dress? Yes! One of the wedding accessories not to forget is your garter! This is of course for the modern day tradition of wearing a garter so that the groom can remove it at the end of the day and fling it into the crowd of male guests. For a few choices on beach wedding garters click here. Shoes are of course important beach wedding accessories. The priority is comfort! There is a huge array of styles available for you to choose from and that is why we have decided to dedicate an entire page to shoes as well. Follow this link to find out more about beach wedding shoes for the bride. People don't normally consider bouquets as beach wedding accessories, but they are as much an accessory as your tiara or necklace and it will be the final touch to complete your look on your wedding day. It must accentuate your dress, your height, your color scheme and your beach wedding theme. Click here to see hairstyles with which to wear your beach wedding accessories.